Prepare your consulting practice for the new year by identifying the specific, granular actions that will grow your firm. But what should you ponder to determine those actions that will make next year waaay better than this year? When evaluating the success of their year, consultants often review metrics like revenue, profit per partner, utilization and leverage. However, these statistics don’t provide useful direction on how to adjust, transform or maintain your consulting practice. That’s why I examine a broader array of performance yardsticks. It’s the difference between evaluating your baking prowess on whether your family thinks your cookies are good (which doesn’t tell you how to make them better), versus whether they’re sweet enough (yup), moist enough (yup), or chocolatey enough (definitely not). Below is a subset of the metrics I consider, along with the benchmarks I use to direct improvements in my offerings, processes, and priorities. 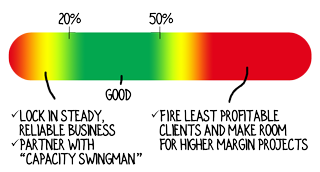 What percentage of clients from the past 24-months signed on for at least one more project? What percentage of this year’s revenue was derived from three or fewer clients? What percentage of this year’s revenue came from new clients? 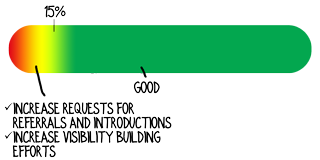 What percentage of the opportunities that surfaced turned into closed projects. How much did your Network Core grow? On average, what percentage of your time was devoted to marketing your services? 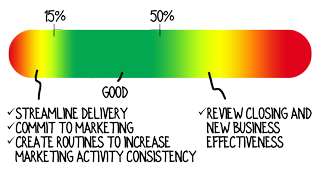 What percentage of your planned marketing achievements did you accomplish this year? How much did your average project size increase vs. a year ago? What percentage of your year’s revenue was low-margin, “bread and butter” work? That’s a quick glimpse into a few of the yardsticks I’ll be reviewing over the next few weeks. What metrics are you reviewing to gauge your performance and suggest concrete, useful direction to improve your business next year? David, you’ve done it again. What a great way to review your own book of work! As consultants, we often work on a treadmill – the “get the work done/pitch more work” rut – and don’t take the time to evaluate our effectiveness in growing the business over multiple metrics. Especially love the “bread and butter” metric – it’s difficult/emotional/uncomfortable to let go of long-time but less profitable clients. While you might not immediately cut the tie, that metric will help re-focus your attention on making those clients more profitable, if possible, before moving on. “Difficult” and “uncomfortable” are two good adjectives to describe the notion of firing good-but-unprofitable clients, Cynthia. You’re absolutely right. For most consultants, those clients are long-time, loyal customers who have been around since the beginning. Walking away from them is a an emotional decision. Thank you for being part of the conversation, Cynthia. firing clients is one option. Fixing them is another. Indeed, Don, if you can convert a low-margin client to a high-margin client, that’s ideal. However, that’s often a tough row to hoe for many (most) consultants. Often the consultant is perceived (a.k.a. pigeonholed) in a lower-end role than they’ve achieved with their new, high-margin clients; or, legacy clients have a much lower fee structure and struggle to accept higher fees; or, low-margin clients have shallower pockets if the consultant has stepped up from, say, clients with $100 million in revenue to clients with $1 billion. Whether you adjust or fire the low-margin clients, as long as you’re taking the opportunity to increase your average fees you’re on the right track. Thanks for diving deep on this one, Don. I’ve had a couple of instances where the fix was to narrow the scope and volume of work, increase my scheduling flexibility and raise the billing rates. The happy clients paid less in total and improved their value:fee ratio (despite a higher billing rate). I raised my billing rate and was able to service the client in under-utilized periods which avoided displacing other attractive assignments. Hence, more profits for both client and consultant. You’re very welcome, Jim. Use them well and enjoy a gangbusters 2017! This article makes a great point — your metrics should give you direction for how you can increase your success. I like the diagrams also. I will use several of the metrics you suggest in planning what I’ll do in the year ahead at my business. Thanks. I couldn’t agree more, Bernadette, that metrics are only useful if they tell you what to do. (Speed up, slow down, maintain 80 mph.) The same goes for information gathering: you have to know what action you’re going to take based on the information you gather before you solicit data. Your comment is much appreciated. Good luck with the 2017 planning! very good advice — what we advise our own clients in terms of the motivations for performance measurement. How do you deal with metric dependencies? 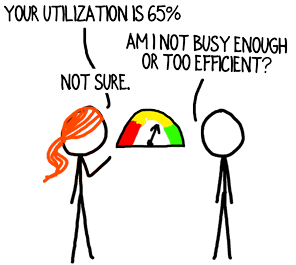 For instance [given relatively fixed capacity and high utilization], increasing project size (which can be a positive) means some adverse tradeoffs (e.g., fewer projects which can lead to fewer assignments, fewer new clients, lower repeat rates, bumpiness of workload, and less time available to market services). Don, the issue of trade-offs is a very good one. I’d challenge some of the assumptions, though. Starting with fixed capacity chokes a consulting firm and isn’t necessary. (I wrote an article a few months ago about the need to have a “capacity swingman” on your team.) In today’s marketplace, you can always find help, and every consulting firm can increase its capacity using virtual resources. If utilization is high then you need to work on streamlining, systematizing and delegating. I like that you’re bringing up the issue, Don, because it ties to a trend I’ve been seeing among the consultants and firms I work with: the highest priority challenge is shifting from finding clients to getting more work done then finding more clients. That’s a sign of a robust (consulting) economy.